Every time we travel by flight alone, we secretly hope to sit next to a cute guy/girl or an interesting conversationalist to make the long hours feel shorter. But if experience is any indicator, you’ll find yourself sitting next to that noisy fellow or an annoying cranky kid or worse, an uninteresting talkative person. And suddenly, the long hours seem endless. However, we have reason to rejoice! Latvian airline airBaltic has introduced a first-of-a-kind intriguing feature called SeatBuddy that pairs like-minded travellers. 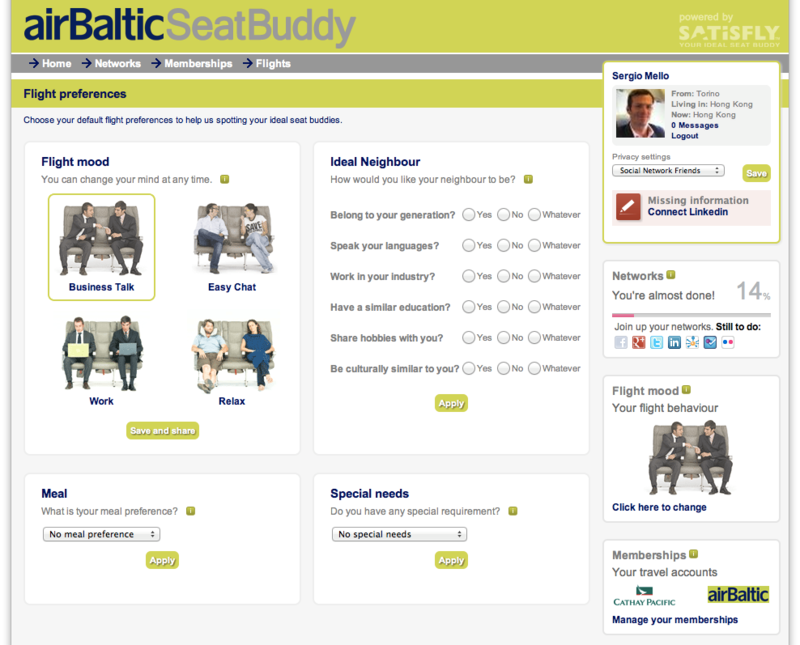 This free service aims at finding you a partner that is in the same ‘flight mood’ as you. Potential matches will be asked questions that range from ‘Do you snore?’ to ‘Will you be accompanied by bratty children?’ to suit your needs. And if you’re the kind of traveller that enjoys his/her peace and quiet and has no intention of interacting with anyone, don’t fret, as this innovative service can find you a suitable partner that will let you be. There are four moods to choose from: business talk, easy chat, talk and relax. So if you want to focus on networking, select the ‘business talk’ option and if you simply want to have a casual conversation with someone, tick the ‘easy chat’ option. This is an optional service that caters to both sociable and non-sociable air travellers. However, the only drawback is that passengers will not be able to ban anybody from sitting next to them. But after all, there is always a surprise element here as you won’t know who you’d end up sitting next to, even though you have an idea of the kind of person you’d like to spend that time with. Acquire more info about the place you're going to visit before booking a flight there. You should also determine how much are the cheap flights to manila and back, some airline company have promo that will give you big discounts. Yes Shrinidhi. Hope it gets incorporated in Indian flights too. In all of my air philippines booking, I am really particular about my seat selections. No window seat as much as possible. It's a good thing that there are a lot of initiatives that make setting travel itineraries easier. I'm really terrified of air travel. Good thing that I have philippine prudential insurance. The thing about it is that it's like a fat pants, you're happier not being able to use it but you're glad to know they're there. Finally, a convenient way to have surfing lessons in the pristine beaches of Bahamas without sacrificing my energy talking to a motormouth. I hate it when I travel and I get to be seated with a person who has nothing to do but talk. I'd appreciate it once every 4 hours, but seriously, all day?